Ashkelon has been on the front line of Hamas rockets for years but Monday felt different. 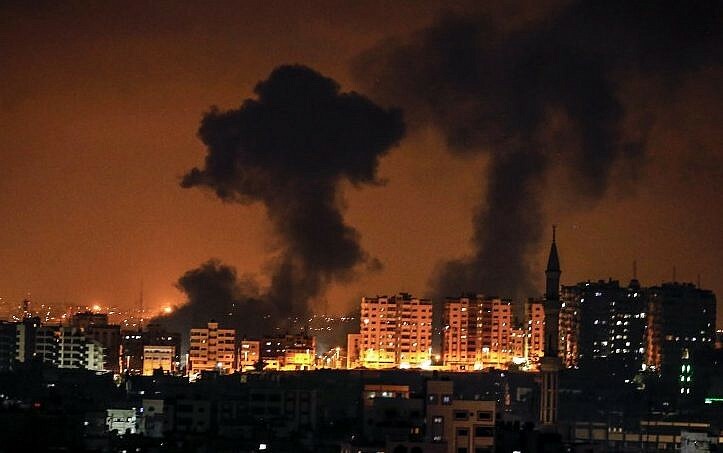 After several direct hits to buildings, the city felt more exposed than usual, despite the Iron Dome, which was intercepting rockets overhead. I drove in after midnight after reports emerged that a rocket had struck a house. In a residential neighborhood, the street had been cordoned off by police and emergency services. Search and rescue teams and the fire department were deployed. A long line of people, mostly residents of nearby apartment buildings, were standing on the street. Some had been evacuated from a building that was struck. Others were awakened by the impact. There were young men and older women in bathrobes, having come out in the brisk night air to see what was happening. Many seem traumatized, some hugging, a few crying. Emergency workers were speaking to the residents. The smell of gas hung in the air and the fire crews warned people not to smoke. As the crews worked in the building, sirens sounded overhead and the scores of residents who had come out now had to run to find shelter. Some crouched down next to cars and walls. Overhead Iron Dome missiles intercepted several rockets. Flashes and booms could be seen and heard. It was a duel in the skies above, a war over our heads, while on the ground the emergency crews waited to emerge and get back to work. The working class neighborhood where the direct hit happened seemed like it was already suffering through this war too much. Some people had blank stares, others seemed nervous. The urban area felt claustrophobic, like there was no where to run from the rockets, even though there were many options to seek shelter. The large number of emergency crews, and the presence of IDF search and rescue units, showed that the emergency services were well prepared for this eventuality. Eventually a 60-year-old man was found dead in the rubble. Another man and woman were found on the fourth floor of a building that was struck. Driving out of the city after 1 in the morning, with the radio giving more updates of nearby sirens and rocket fire, the sense of impending conflict was palpable. The tragedy in Ashkelon will be learned from and examined. But for the residents, suffering trauma, the memory of this night will remain.